Random thoughts on random subjects, AKA life and living it. 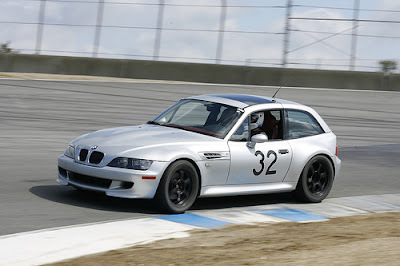 I spent a beautiful Wednesday at Laguna Seca raceway, with NASA Proracing. My last track outing in November was mostly an attempt to get my head back into driving fast, and taking some time to share the fun with Ron riding shotgun. As I wrote then, lots of stuff was out of sorts: tires, track, and confidence. Lagnua Seca is one of my favorite tracks, and I have had more track time here. I've logged the most virtual track time at Laguna as well via the best video game ever: Sega's Ferrari F355 Challenge. That and having taken the Skip Baber 3-day racing class here doesn't hurt. So I felt right at home even on the first lap. The only place I was loosing to the Cayman S was in the braking zones. The brakes just didn't feel very inspiring this outing. Time for some racing brake pads. Here is a short video including my second fastest lap. Its a tad more interesting: I pass a miata and spend the whole rest of the lap chasing some 911s and keeping ahead of a red Porsche CaymanS. Labels: traqmate "lagnua seca" "m coupe"
This is a Flickr badge showing public items from randomstring tagged with cars. Make your own badge here.